Writing music is both natural and important to me. Transforming emotions, experiences and all the other things that are part of being human into music is extraordinarily inspiring. It’s rewarding and drives me to do new work again and again. My music is expressive and honest. It loves beauty, but is continually driven to explore its contradictions. It is not afraid of the dark or opacity. It shifts effortlessly between different moods and characters. It is not afraid of being real. 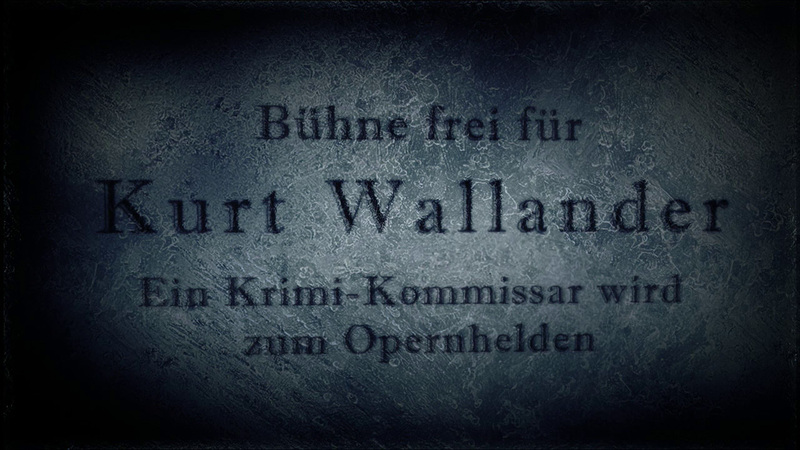 Kurt Wallander is 60 years old and is on the brink of retirement. When Tobias Jonsson tells him that fifteen years ago he was innocent, yet was arrested and convicted for the murder of his father, doubts begin to plague Kurt about whether he made serious mistakes during his investigation. Against the orders of his superior, he has the old files retrieved and takes up the Anders Jonsson case once more. Kurt’s worsening dementia and mood swings cause Linda and his colleagues to become increasingly concerned about his state of mind. Years ago, 35-year-old Linda Wallander followed in her father’s footsteps and became a police inspector herself. She supports her father, but worries too about his worsening dementia when he takes up the Anders Jonsson investigation again after 15 years. His mood swings and irascibility often frustrate Linda. When he is released from prison after fifteen years, Tobias Jonsson, who, like Linda, is 35 years old, wants to make it plain that he was unjustly convicted of murdering his father. The public image of his father was so important to Tobias that despite being innocent, he preferred to go to jail rather than reveal his father’s secret. Fifteen years earlier, Anders Jonsson was murdered at the age of 45, and his son Tobias was convicted of killing him. But when the case is reopened, another side of Anders is revealed. While he was a sympathetic, loving man, to whom his high standing in society was very important, his life had been shaped by a troubled youth and a secret about which even his girlfriend Christina had no clue. A passionate relationship tied the Lutheran priest Christina Berglund to the murder victim, Anders Jonsson. Shortly before his death, she offered to remain with Anders rather than go on a mission to Africa, but he refused her offer. Broken-hearted, she left for Africa alone and there learned of the death of her lover. Even after fifteen years, Christina is still mourning her lost love. Fifty-year-old Fredrik Berglund is Christina’s brother and was Anders’ best friend. When he reads a letter that was actually addressed to Christina and learns of Anders’ secret, he begins to question his and Christina’s relationship with Anders. On the one hand, the chorus serves a narrative purpose, speaking as one to provide structure and commentary on all situations and events. At the same time, the chorus also expresses the inner feelings of the characters, and Kurt’s perspective above all. Occasionally, individual members of the chorus will step out of the group, and embody in a few lines various minor characters that have short parts in the libretto.